This competition is open to anyone with a UK postcode aged 18 or over. The competition closes at 23:59 on Sunday 17th December 2017. Entries received after this time will not be accepted. 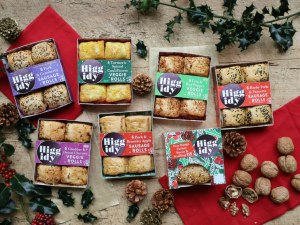 The competition can be entered by posting which wintry Higgidy recipe you will try this festive season as a Facebook message to the Family Holiday Association or a comment on the competition post, on Twitter, or as a comment on the Instagram competition post. The prize is 2 x Free Range Turkey, Bacon & Stuffing Pies, 2 x 6-Pack Pork & Cranberry Sausage Rolls, 2 x 6-Pack Pork & Bramley Apple Sausage Rolls, 2 x 6-Pack Herby Pork & Pancetta Sausage Rolls, 2 x 6-Pack Turmeric Spiced Cauliflower Veggie Rolls, 2 x 6-Pack Feta & Red Pepper Veggie Rolls, 2 x 6-Pack Cheddar & Onion Chutney Veggie Rolls (14 products in total). The home address of the winner will be requested, and the prize will be sent in the form of a voucher. The Family Holiday Association and Higgidy accept no responsibility for any damage, loss, liabilities, injury or disappointment incurred or suffered as a result of entering the competition or accepting prizes. The Family Holiday Association and Higgidy further disclaims liability for any injury or damage to your or any other person’s computer relating to or resulting from participation in or downloading any materials in connection with the competition.